Miracle March? March Madness? During this past month the Storm Door finally opened and Mother Nature brought winter back to northern Nevada… Gotta hand it to Punxsutawney Phil! And, as I write on this first full day of Spring, a Winter Storm Warning is posted with the caveat that this system includes an Atmospheric River (i.e. Pineapple Express) to bring much needed rain to our valleys and snow at higher elevations. How much more snow before the end of the month? Stay tuned, as it’s not over until it’s over or until the Fat Skis sing! . . .
Here’s how April is shaping up in Northern Nevada. 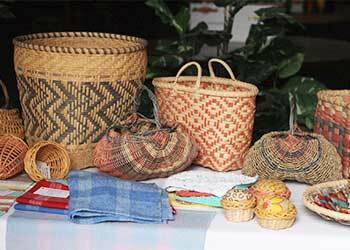 Carson City has a very positive arts community with many summertime events and art galleries as well as the Nevada State Museum. 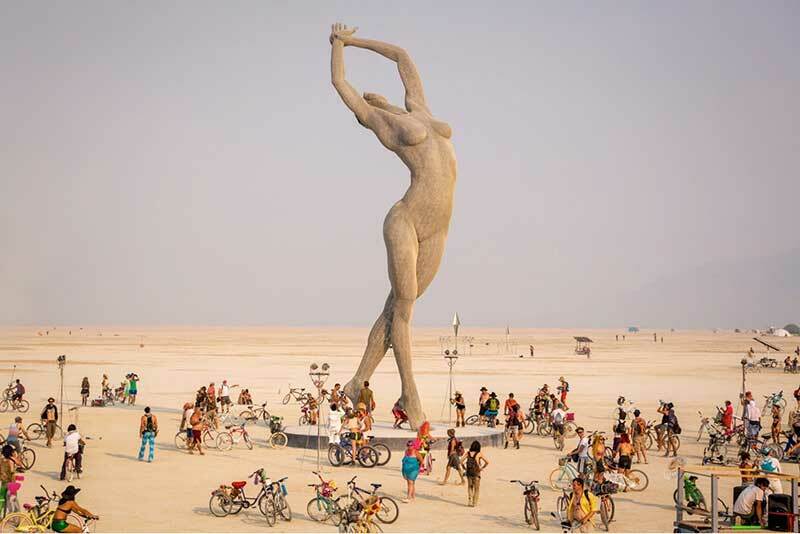 Next month we will come back for a closer look at the art happening Carson City. In the meantime, check out an artist reception at one of my favorite Carson City art galleries, Artsy Fartsy. Robin and I drove east along The Loneliest Road and made our first stop in Fallon. This old farm town has become surprisingly well-known for its eminent cultural presence at the Oats Park Art Center, and now — even more surprisingly — it’s known for its food. We count half a dozen excellent sources of deliciosity in Fallon. And the Churchill County Museum has some interesting quirks. 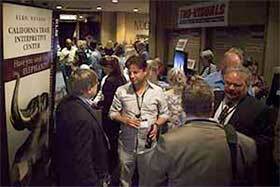 The signature scene that remains in my mind from Rural Round Up 2013 took place in a hallway leading off the casino floor past the poker room and the big bingo parlor to the meeting rooms, where it makes a right-hand turn to get to the bowling alley. 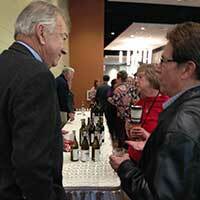 So at six o’clock when the corks were popped and the tasting began, the hallway was jammed with people. Eventually they all had tastes, some more than one, and after priming their pumps with these thimblefuls of bottled sunshine, graduated to the bar for bigger glasses of lesser stuff. As they did, the wider part of the hallway at the entrance to the bowling alley slowly filled up with people from around the state happily babbling together. 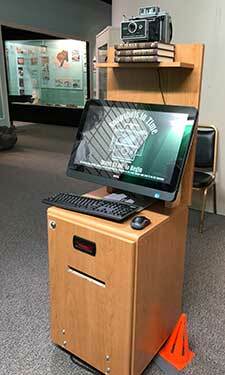 I am talking about the Photo Booth which sometimes travels with museum Director Dan Ingram to public events, where it quickly becomes the center of attention. It’s not really a booth — i would call it a funny-looking gizmo — but it does what a photo booth does, which is to accept a $1 bill and snap a picture of whatever is in front of it. If that’s you, when the photo appears it shows you standing in front of a hallowed Fallon landmark! It’s hard to snap just one! 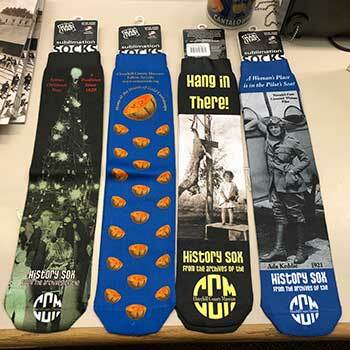 In the Gift Shop, along with History Socks at $10 a pair there are lots of Nevada books . . . pus a collection of head-scratchers. “Cool Comfort: America’s Romance with the Air-Conditioner” was one, along with “Jesus & Gin”, “Toothpick: Technology & Culture”, “Footnotes on Shoes”, and “Eating for Beginners”. This oddly charming agglomeration of strange books lends a mite of whimsy to the atmosphere. More fun: Tours of Hidden Cave are offered on the second and fourth Saturdays of each month (excluding federal holiday weekends). On these days the museum opens at 9 am, the BLM guide arrives at 9:30, and at 10 participants caravan out to the cave site. Fallon is the jumping off point from the solid ground of modern civilization into the shock of the desert. The deeply rooted havens of Middlegate and Cold Springs Stations cater to the travelers on the Lonely Road. Through Austin, over the Toiyabes, down the other side and out again into the sagebrush. Finally, at the last rise before Eureka — we see . . . a mirage. Not the shimmering dazzle across the pavement ahead that we see on a sweltering afternoon, but — a Supermarket! 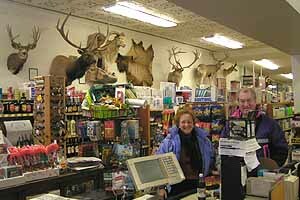 Raine’s Market was a tradition on Main Street since the Raine family bought it from the Kitchen family about three generations back, and began decorating the walls above the shelves in the high-ceilinged old building with taxidermy. They seemed to stock all of life’s necessities on the jam-packed shelves and could help you find them. 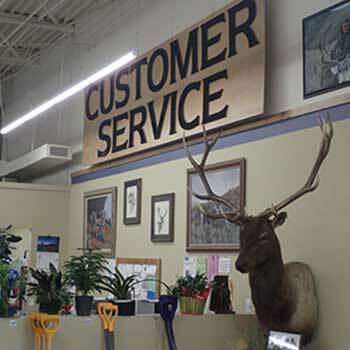 “Wax paper is right below the moose head over there.” The Raine’s met the needs of the community with graceful efficiency but increasing difficulty because of the old structure’s limitations and stricter health codes. This big new store — it’s no mirage — contains a Nevada State Bank and an Ace Hardware as well as a cornucopia of groceries and a full-service deli. It is spacious and open and sparkling new, a striking contrast with the old store’s maze of narrow aisles and oiled wood floors. 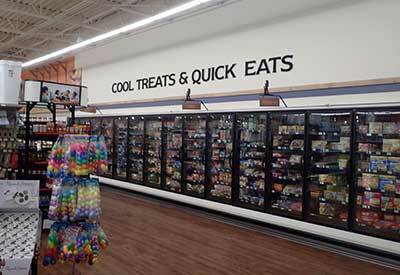 This would be a very nice store anywhere. Out here it is spectacular. It’s good to see the old city looking busy again. The closing of the Ruby Hill Mine just uphill to the west and the Pancake Mine east of town had sucked some of the energy out of this happily remote community. Without those jobs, For Sale signs sprouted in dispiriting profusion. And now the profusion is of white pickup trucks, most of them mud-spattered with red banners flying, cruising in and out of town. Mining has come awake again, and Eureka is waking up with it. The Gold Bar Project on the southwest slope of Roberts Mountain — formerly the Atlas Mine — is expected to put about 200 people to work in construction, and 150 to operate it once it’s built. 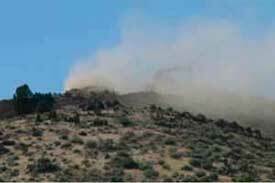 The Tonkin site around the mountain on its northwest side is also being evaluated. To the east the Pan Mine is being prepared to go back into production and the word on the street is that a second pit is being considered there as well. Rentals are scarce and the For Sale signs are coming down. There is no Visitors Center in Eureka, but out-of-towners are welcome to bring their curiosity about Eureka County, food and lodgings included, to the Court House where the staff is glad to answer your questions during business hours. 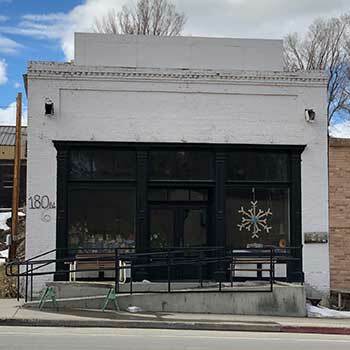 On weekends during spring and summer the Eureka Restoration Enterprise, a local organization devoted to to helping create a more inviting community (thus the murals beginning to appear around town) opens its doors at 180 N. Main to offer regional art and homemade Nevada products. The volunteers are happy to help you find your way around. 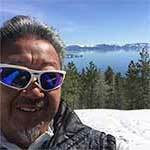 The Owl Club has been at the center of the action for visitors to Eureka since Ted Carrion bought it in 1981 and his son Ron came from Lake Tahoe to manage it in his convivial style. Now Ron’s daughter Eleny Mentaberry runs it with her husband Scooter. The tone that Ron established for his restaurant has been retained, with a full bar adjacent and a big room used for banquets and dances just past the bar. Rich McKay grew up here, and in 1983 he confronted the career options facing every graduate from Eureka High: #1) live and work on the ranch (if you have one, which Rich’s family did), #2) go to work at the mine (if the mines were running (which they were in ’83), or #3) go to work for the County. Rich took Option #4) which is to leave, and went off to college in Idaho. 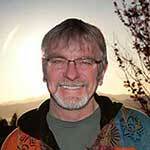 That became his springboard to a career in high-tech in the San Francisco Bay Area. He didn’t have any thoughts about coming home until he had kids, and then he did, more and more. So when Aunt Margie’s Sundown Motel across Main Street (US 50) from the Owl Club became available, Rich came home. With his nephew Giovani Minolete, he bought it, along with the Chevron station at the uphill corner and the Eureka Hotel/Cafe at the downhill corner. Now it’s likely to be his wife Crystal who checks you in at the motel while Rich is stocking the shelves at the gas station, or working on the hotel rooms he’s renovating above the Eureka Cafe. This was a Chinese cafe for more than 50 years beginning in the 1940s. It’s not ready to reopen yet, but the Eureka Saloon is going strong, just a few steps up the block. 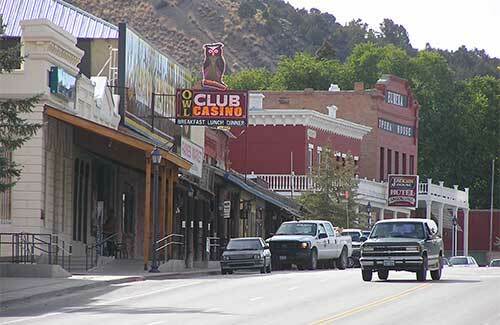 Stayed home to resist the destruction of the Virginia City National Historic District by Comstock Mining Inc.
One of the town’s great treasures is underneath that Cafe: an intersection of elaborate brick tunnels built to connect various buildings in town to facilitate moving around in the frozen winter. One tunnel connected the home of Governor-to-be Reinhold Sadler to his store on Main Street so he could walk between them without concern about the weather. Or to avoid talking with his neighbors, as another story has it. I was struck by Ely‘s plan to beautify 12 downtown blocks by way of an NDOT grant. Add that to the murals already on so many walls, and to the Cuchine Collection Art Show, an exhibit of nearly 200 pieces from Wally Cuchine’s fabled collection of Nevada art. At this rate we will have tourists from all over the world visiting Ely and descending eagerly into the basement gallery beneath the Garnet Mercantile. 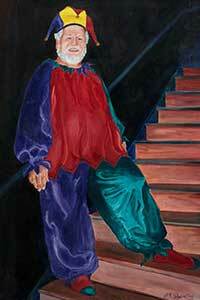 The Opening will be April 1 with a reception for Wally from 2-4 pm. But that’s not all the excitement in Ely. Mark Bassett, Director of the Nevada Northern Railway says that last year was the best for revenue in the lt 30 years, and this year is shaping up to be even better. “We hit the Trifecta of publicity last year!” he told me. First, he said, the New York Times included the railroad’s “Be the Engineer” program in a December article about unusual Christmas gifts and they sold lot of ‘lifelong memories’. Then in February the photographer who manages the traditional Winter Photo Shoot phoned to say that the railroad was featured on “The Big Bang Theory” in an episode all about Sheldon getting a “Be the Engineer” ticket on the Nevada Northern! And finally (check my math, but I think this makes it a Quadrifecta), there is an Iron Rule that engine crews are to be on hand and ready to roll 45 minutes before the scheduled departure. One morning as Mark was checking the railroad’s Facebook page he was horrified to see a that video had been posted showing the engine crew cooking bacon on a shovel in the locomotive’s firebox. Mark sprang for the telephone. And as he waited he noticed that the video, posted two hours before, had already been viewed 20,000 times. As Mark watched, the video was deleted. He sprang for the phone and called the volunteer again. The restored post accumulated clicks at the rate of 20,000 an hour and eventually totalled 1,200,000 hits. And on September 2nd this year the NNRy will host the first Iron Horse Cook-Off at the depot in East Ely. 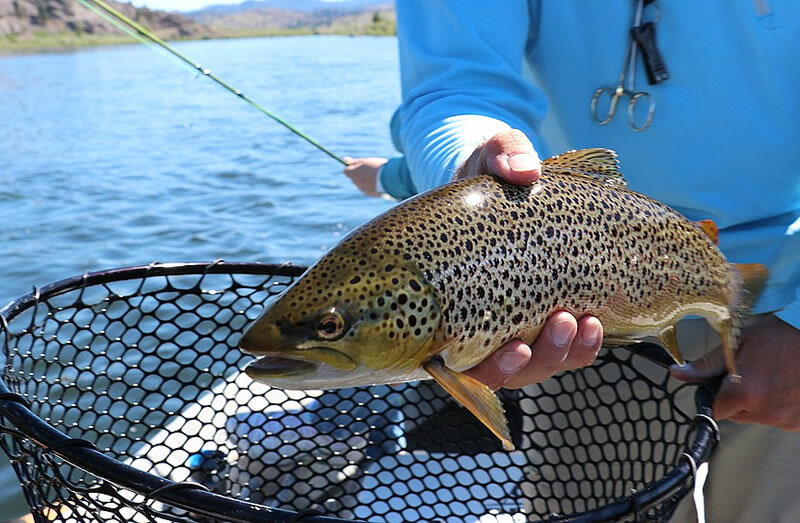 Topaz Lodge Fishing Derby appeared first on The Nevada Travel Network. 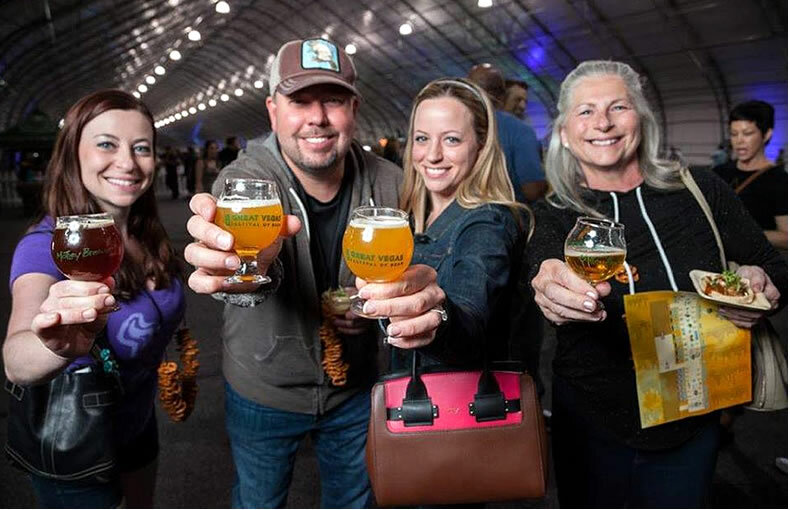 Great Vegas Festival of Beer appeared first on The Nevada Travel Network. 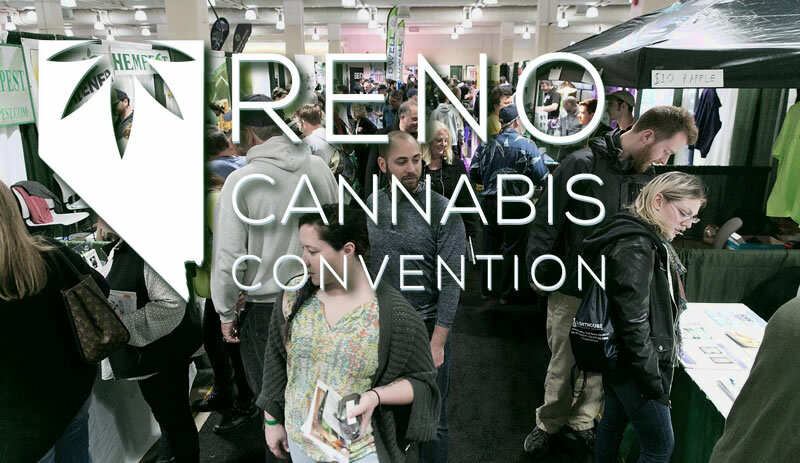 Reno Cannabis Convention appeared first on The Nevada Travel Network. Laughlin is a great place for having fun and I am a big Fats Waller fan, so I’m snapping my fingers and strutting on down to the Ramada Express where Ain’t Misbehavin’ is playing for 10 days. So unless your feet’s too big, bring your honeysuckle rose and get there, because the joint will be jumpin’. Across the street at the Flamingo The Comedy Stop is performing two shows nightly, 3 comedians each show, with new comedians changing out each Monday. 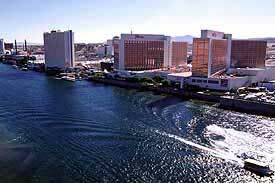 The following weekend is Laughlin River Days, a citywide boat racing spectacular with a Beach Boys concert. 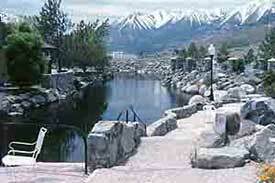 David Walley’s Resort about 1.3 miles from downtown Genoa (oldest settlement in Nevada) is welcoming guests for a Memorial Day Weekend of peace and quiet in the bubbling hot springs pools with their beautiful views of the surrounding valley and majestic mountains. It’s delightful and serene with lots of amenities: restaurant and deli, massages in a full spa, swimming pool. They have time shares they also use as a hotel open to the public, Yep, that’s the event, peace and quiet. A little slice of heaven.